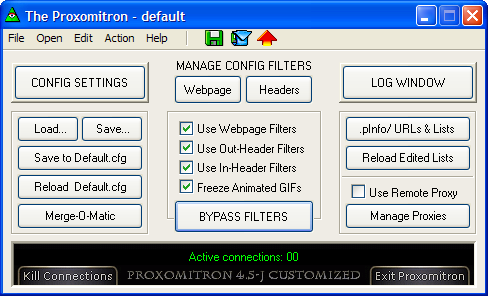 A Windows XP graphical user interface for Proxomitron 4.5-J. Zipfile contains the quick and easy patcher program, plus font and readme. Main Screen, with XP theming of buttons. 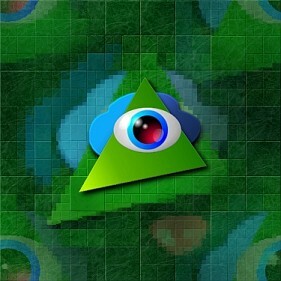 Entire background uses the "Face 2" texture. Shown here is the default bitmap (a simple coloring). PtronGUI applies cosmetic interface changes via the program's resource files, plus makes a few hex edits. and switching the font used for the filter editors' input/edit fields from Courier New to Andale Mono. PtronGUI makes no changes to (nor to affect) Proxomitron's core program or operation. thus, PtronGUI is free to distribute, with profound gratitude to Scott's generous nature as well as his genius. For those needing it, here is an RWIN patch for Proxomitron customized with PtronGUI 1.2. Starting with the next update, an RWIN patch and info will be included in the PtronGUI distribution zip.